Finished with one week left to enjoy it before Halloween! As you could probably tell from my last post I decided to quilt this in fat horizontal stripes. I had the idea mainly out of quilting laziness, but then after I saw this quilt I was sold on the idea…and the fact it took about half an hour helped too. I had no quilt-holder-uppers ( they all hide when they see a quilt+camera in my hand) so I taped the quilt to the dirty garage door. I really like the way the black strips stand out when you skim over the quilt with your eyes. I love love love this quilt! What a great idea for a strip quilt. So what was the secret to getting the wonky strips to lay flat? I adore the look of this. This is wicked :) Love the contrast of colors! Oh my gosh I LOVE it!!! The fat strips came out perfect!!! Fun,fun, fun. I like the horizontal quilting. Great idea. Love this quilt! Fun pattern, quilting, and colorway! Fantastic! Gorgeous! I would have never thought to do the quilting like that, but really love it…nice job!! Looks great! I'd love to hear the secret on getting the curvy/wonky seams to lie flat. What a fun quilt! Love to see all those discontinued fabrics in one place like that too. LOVE that background fabric. I will have to look for that one at J's. I love love love love this quilt. and the quilting is perfect for its design too! Wow- that looks great! And I love the backing! How have you been feeling lately? this is amazing…i love it. everything about it screams, no pun intended, fun!!! It's so striking! I love it – sometimes simple is simply the best! It turned out so great with the horizontal quilting! Lines going in either direction hehe I've been looking for some nice black and white fabric and the Joann's backing is pretty nice! Looks great! I love the orange-y brightness! She's a beaut! I like the quilting a lot – I just did one the other night in plain diagonal lines. Sometimes simpler is just better, I think. were you stippling on your normal machine? would you do a tutorial??!! That quilt is beyond awesome. I love the colors and the stripes. Thank you for sharing it with us. I absolutely love this quilt and the beautiful patterns you used! Great colors too! :) Nice job! Beautiful colours, great fabrics, stunning quilt! 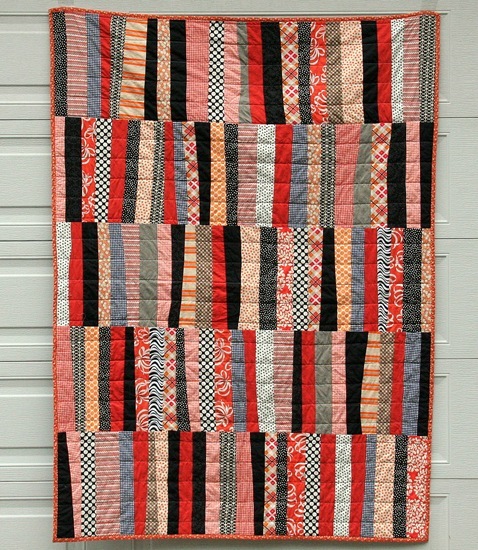 Love this quilt…the colors are great…..come over to my blog and check out the wall hanging I made from ur tutorial! This is wonderful! Love it. This is absolutely gorgeous! It is totally my style! I love the stripes! It's perfect! 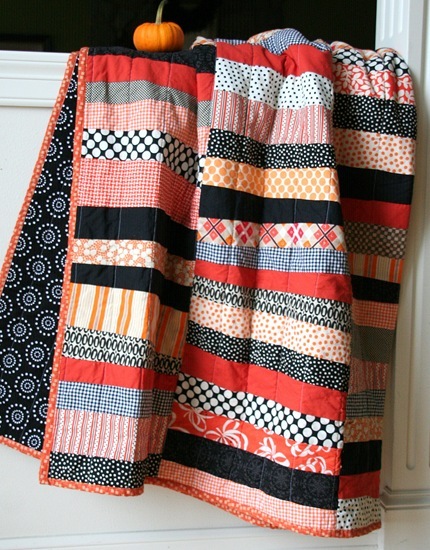 Have you ever saw a quilt on a blog and you just couldnt stop going back and looking at it? This quilt did that to me!! I LOVE it! For some reason it reminds me of Halloweens when I was growing up in the 70's! After I saw it I started pulling oranges and blacks from my stash! I havent made a wonky stripe quilt yet, any hints? Thanks for sharing your blog with us!! Thanks for sharing another great quilt with us! What cute quilt. I need to make another Halloween one! it's lovely. i do love the simple quilting. so nice. Since orange is my favorite color, you know this one is a hit with me. The horizontal quilting lines were so simple but added SO much to the overall effect. Someday, after our remodeling is done (sigh), I'm going to have a big enough couch (can only fit a love seat in now) so I can leave a seasonal themed quilt out on it all the time. How perfect this one would be for this time of year! Very cute, very fun! I like the way you chose to quilt it! Fantastic. Halloween-y and yet not, at the same time. Absolutely gorgeous – the colours are fantastic! I love this quilt! How did you get the quilted lines so straight? The quilt looks great! What a fun project. nice job mixing prints.. i love halloween… & anything orange!! Seriously love this! This style of quilt is exactly why I started quilting 5 weeks ago!!!! Please, tell me how you did this?!?! I am self-taught and a very basic sew-er…. any tips you can give or patterns you can suggest!?!?!? 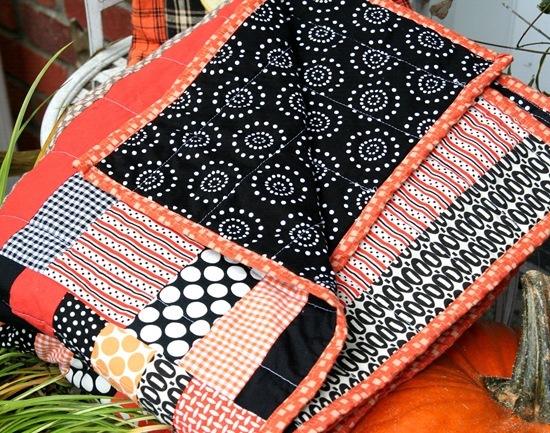 Wow love this quilt…can you share how you made it…or do you have a tutorial for it…love it love it…. Beautiful job! On my to do list! !